There are a lot of initiatives out there focused on financial education. America Saves is one and from that stems Military Saves. One thing that I want to be doing more of is helping to raise awareness of these campaigns that already exist (remember Women’s Money Week back in January?). Military Saves Week is a week is focused on you guess it-saving, but it does more than that as you will hear today. 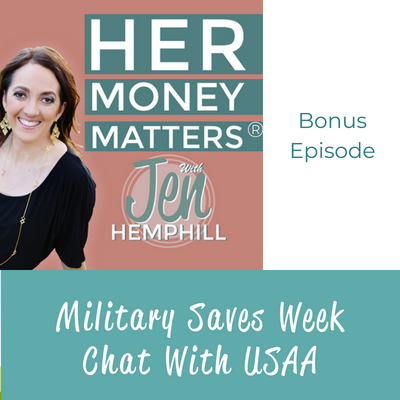 In this bonus episode I chat with JJ Montanaro and Andrew Porch from USAA Federal Savings Bank about Military Saves Week. We talk about what it is, the importance of this campaign, some success stories, and what USAA has done internally within their company (which is pretty cool). Even though the official week happened February 27th-March 4th you can still take the pledge through the end of March. I’ve taken the pledge, will you take the pledge with me? America Saves Week started back in 2007, it is an annual event where organizations can promote good savings actions and a chance for individuals to really take a look at their own saving habits. Military Saves Week, as you probably guessed is more focused on the military population, but the message is the same. During the designated week there are different events you can participate in so make sure you take a look at the website so you are in the know for next year. My hope for today is to raise awareness that this campaign exists and for you to take the pledge. I personally took the pledge as we saving for our “forever” home. Military Spouse or Service Member? Click Here To Take The Pledge! To take the pledge on America Saves CLICK HERE. I’m curious….is this the first time you have heard about America Saves/Military Saves? If so, please let me know by commenting below or head over to our community on Facebook and letting me know there.